No, I’m not talking about the convenience store, though, now I want a Slurpee. I’m talking about July 11th, 2018! A day that will live in infamy! It’s a Wednesday! It’s New Comic Book Day! AND I’ve got TWO books coming out that day! 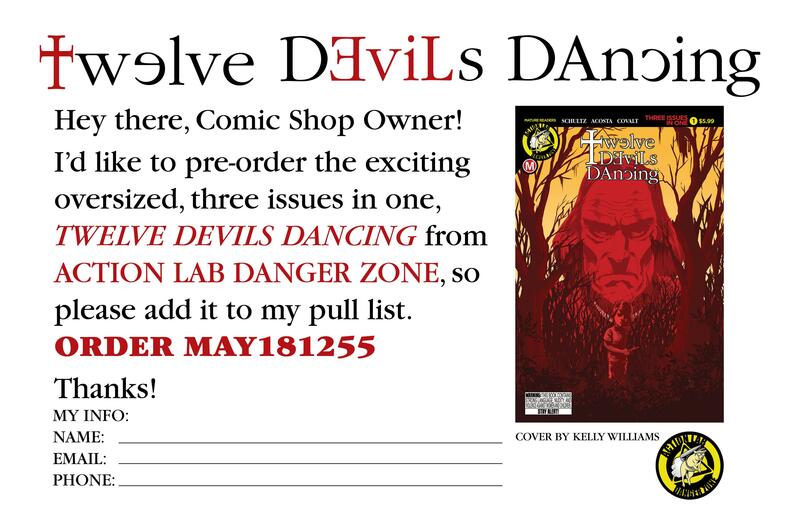 First up is Twelve Devils Dancing from Action Lab Danger Zone. Twelve Devils Dancing is a horror/crime thriller written by me, drawn by Dave Acosta (Doc Savage: Ring of Fire), colored by Andrew Covalt (Courage the Cowardly Dog), and lettered by Cardinal Rae (Crowded, Rose). The story follows Callum Cooper, a retired FBI agent, and Aisha Miller, a college student on the run, as they work together to stop a serial killer. It’s for people who love shows like Mindhunter and Criminal Minds. 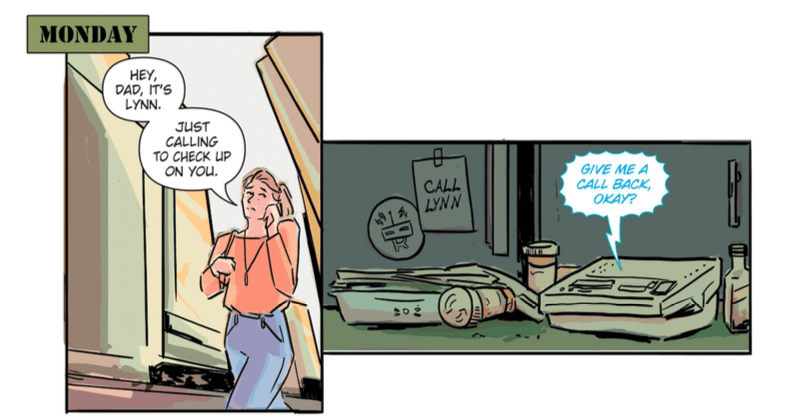 This is my first time working directly with Action Lab Danger Zone, though I had a story in the Harvey nominated The 27 Club, A Comic Anthology from Red Stylo Media. 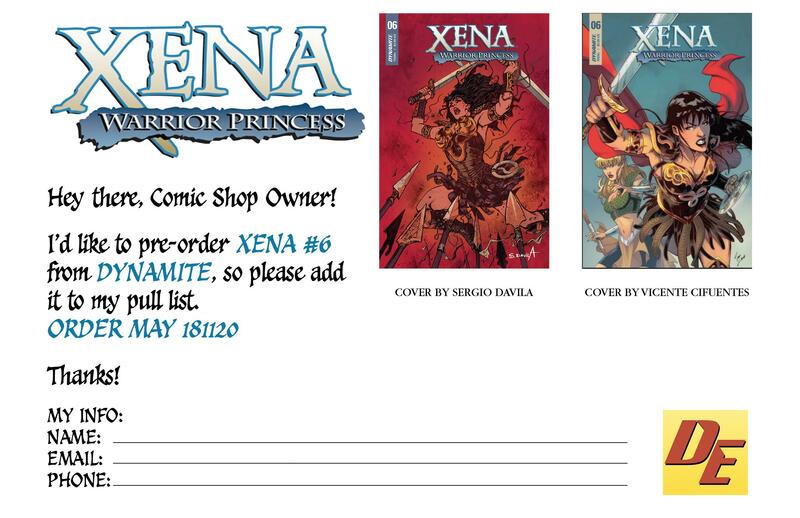 The SECOND book coming out on July 11th is Xena #6 from Dynamite Comics. I’ve had the pleasure of working with Dynamite in the past on Charmed and the Swords of Sorrow crossover series. Right now, the fierce Meredith Finch (Rose, Wonder Woman) has writing duties, but I’ll pick up the Warrior Princess’ story after Meredith’s arc. I have to admit that I hadn’t watched the TV series, BUT don’t be afraid, fans of Xena and Gabrielle, I’ve done my research! If July is too far away for you, I’ll be appearing at several signings with artist Liana Kangas for Where We Live, an anthology to benefit the survivors of the Las Vegas shooting in October of 2017. This anthology is in stores May 30th, and was curated by JH Williams III, Wendy Wright-Williams, Will Dennis, and published by Image Comics. There are amazing contributors like Michael and Laura Allred, Joëlle Jones, Kelly Sue DeConnick, Bill Sienkiewicz, Neil Gaiman, Gail Simone, Cliff Chiang, and SO many others. In fact, to see a complete list of contributors, you should follow @WhereWeLive_LV on Twitter. If you’re not familiar with my posts about my father, you may want to check them out. He passed away two years ago, and it’s been a bit of a struggle ever since. And don’t forget, this coming Saturday is FREE COMIC BOOK DAY! Go to your local comic book shop and join in the festivities! I’ll be at The Comic Book Shop in Wilmington, DE, but shops ALL OVER THE COUNTRY are having awesome deals. Bring a friend who’s never read a comic book before. You never know…you may spark something in them. And, lastly, if you’ll be at Motor City Comic Con May 18th to the 20th, stop by my table. I’ll be selling off old comics for a discount, and I’ll also have some cool things like limited stickers and enamel pins! It’s been a long time since I posted, so it was bound to be a rambling affair, but thanks for hanging in! Hope to see you at one of these signings soon! Finally got to the comic shop & left the order for July 11. Looking forward!